Yesterday, we took the kids to the beach. We packed the girls into the car and made it to our "usual" spot at Bonita Cove before 10:30- the time we'd said we'd meet some friends- without trouble. I remember when we first started taking Pumpkin to the beach that we struggled to get everything together, and always seemed to arrive later than we said we would. Now, packing for the beach is a fairly standard routine. Our beach trip yesterday was nowhere near that relaxed. Perhaps the years living walking distance to the beach, without dependents have spoiled the beach for me. But then again, maybe not. Pumpkin and Petunia built elaborate sand castles- with moats!- with Hubby and the two friends of Pumpkin's who also came. Petunia absolutely loved being towed around on a boogie board. She sat upright, balancing almost effortlessly and grinning with a joy purer than anything most adults can remember. There were meltdowns (mostly Pumpkin's, this time, but that is really just luck of the draw), but there was also fun. Even for the grown ups. I guess the jury's out on the beach day thing. We forgot to take our camera, which is a shame, because I doubt I'll be able to really remember that grin on Petunia's face for more than another day or two. Also, it left me with no photos with which to illustrate this post. So I opened up my photo library, thinking that perhaps I'd find a photo from one of those carefree beach days of my youth. No luck. This is as close as I got. It is from a different sort of beach visit- from the other pictures taken at the same time, I can tell that it is near sunset, and we were probably heading down to the main part of Pacific Beach for dinner and decided to just stop and watch the sunset. That casual attitude towards when dinner needs to happen is another thing that has disappeared from our lives along with quick trips to the beach. Something made me keep paging through my photos. 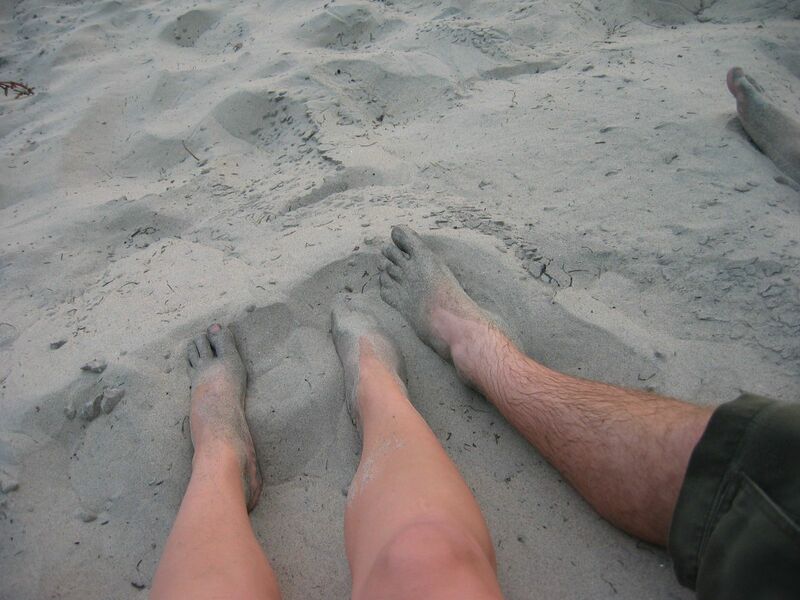 It was weird to look at photos of me and Hubby from 10 years ago. We looked so young! It was also weird to realize that I still own many of the clothes I was photographed in almost ten years ago, and that they aren't even the oldest things in my closet. My husband really wanted me to raise my right hand, but I refused. I really should clean out my closet, but I think I'd keep that skirt. It still fits, mostly because it was a little loose back then. I was feeling a little nostalgic for the travel we did before we had kids- the picture above isn't even from our "real" vacation that year! And then I got to 2007, when Pumpkin was born. She slept like this for weeks. 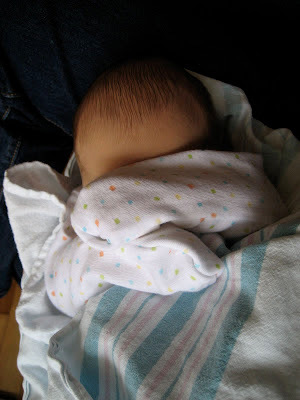 Even the nurses at the hospital couldn't keep her arms in a swaddle. She was a skinny little bundle of wonder and sleeplessness. Don't let the many pictures of her sleeping fool you, this baby was one of the ones who make parents laugh a deranged sort of laugh at the phrase "sleep like a baby." She's 6 weeks old here. It is my 35th birthday. I am exhausted and will soon dissolve into tears at the park we visited to celebrate my birthday. The pictures gloss over the rough parts, mostly. There is a series taken when I took her out to the Law Street park above the beach. Pumpkin is about 3 months old. The sky is a cloudless blue, and the ocean shimmers in the background. Pumpkin is laying tummy down on her blanket, her little head up and looking around- she developed those muscles early, because even then, she wanted to see everything. She's in my favorite pants from that age, which had little colored dots that made me think of microarrays and a waistband with stripes that made me think of gels, so I called them her "DNA pants." It looks like I'm a confident mom, taking my baby out exploring. In reality, I was barely holding myself together through most of my maternity leave, which was coming to an end. I rarely took Pumpkin on outings like this, because I was so desperate for sleep that I was obsessive about trying to be home for naptimes, and trying to get her to sleep on her own so that I could sleep, too. It rarely worked. And she was a high strung little baby, prone to inexplicable screaming fits that I seemed powerless to stop. I think if I could go back and give myself advice, I'd say: "Give up. She isn't going to sleep. And so what if she screams- she'll scream at home, too. Just go out and try to do things." The strangest series of photos, though, are the ones from just a couple weeks after she was born. My husband flew back to New Zealand to be in a wedding of a very good friend (with my blessing) and my parents came over to help me out. Our photos are organized by date, so photos he took are interlaced with photos my parents and I took at home. One photo shows the luxurious room he had at the wedding, the next shows Pumpkin's first nap in the Moses basket my Mom and I bought after hearing someone at breastfeeding support group say that her baby slept better in her basket than her crib. A few photos later, my husband is on the golf course with the groom-to-be, playing his signature style of crappy golf. Then there's me with Pumpkin in her sling and an exhausted look on my face. I remember that morning. It was the day after I'd finally realized that I needed to cut dairy out of my diet, and I was trying to eat my cereal with rice milk. Blech. I soon switched to oatmeal (which I still eat for breakfast, now unable to fall back to cold cereal because Petunia expects to share my oatmeal with me). That series of photos is unfair to my husband, who was fully involved in the night parenting before and after that trip, and was soon just as sleep deprived as I was. Or almost- he would occasionally hit a wall and just sleep through Pumpkin's cries, which is something I never could do. Still can't. Pumpkin, who usually sleeps through the night these days, woke up last night, and cried for Daddy. He went in, but I had to elbow him awake first. And I realized, I am looking forward to showing New York, Easter Island, and all the other cool places of this world to Pumpkin and Petunia, and that is better than being able to get ready for the beach in less than 10 minutes. I've been feeling a little unmoored lately. I can't put my finger on why, and certainly haven't figured out the solution. I feel like I'm drifting through my life, not engaging enough to really direct it. But maybe I should just give in and go where the current takes me. I think that perhaps I gave up control when Pumpkin was born, and I just never realized it. This one hasn't been born yet and she doesn't sleep much. Especially not at night. At least there's no screaming. Good luck with moving forward. I think it's ok to go with the flow and I think it's ok to take charge. Both methods will take you interesting places. Life is, after all, all about the journey, not the destination. 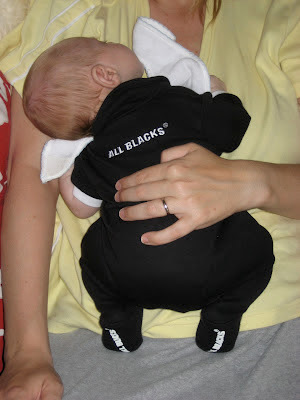 Oh love the little All Blacks onesie! And I too am unable to eat cold cereal at the moment because Moo wants to eat my porridge too... Lucky I like it a lot - but sometimes I look at DK eating his fruity muesli and feel a bit gyped. I feel like I'm drifting through my life, not engaging enough to really direct it. But maybe I should just give in and go where the current takes me. I think that perhaps I gave up control when Pumpkin was born, and I just never realized it. I think I understand how you feel. When you have kids, you have to give up control to a great degree in order to not lose your mind... Learn to go with the flow, live life largely around the kids' illnesses, food preferences, sleep schedules... But I don't think this comes naturally to all people. I know it didn't/doesn't to me. There is a sense of loss that comes with this not entirely voluntary surrender of reigns to one's personal and professional life. As the kids get older and the life gets a little less hectic, as you exit the survival mode, I think it starts to really hit you how much your life if really not within your control. I think some of it is just maturing, perhaps approaching or hitting middle age, but some does have to do with living life as a parent, someone responsible for someone else's entire existence. This is *so* true and I also wonder if it's different for us than our parents. I think my mom's life probably changed a LOT when she got married as there were many expectations around what she had to do now that she was A Married Woman: take care of house and husband. 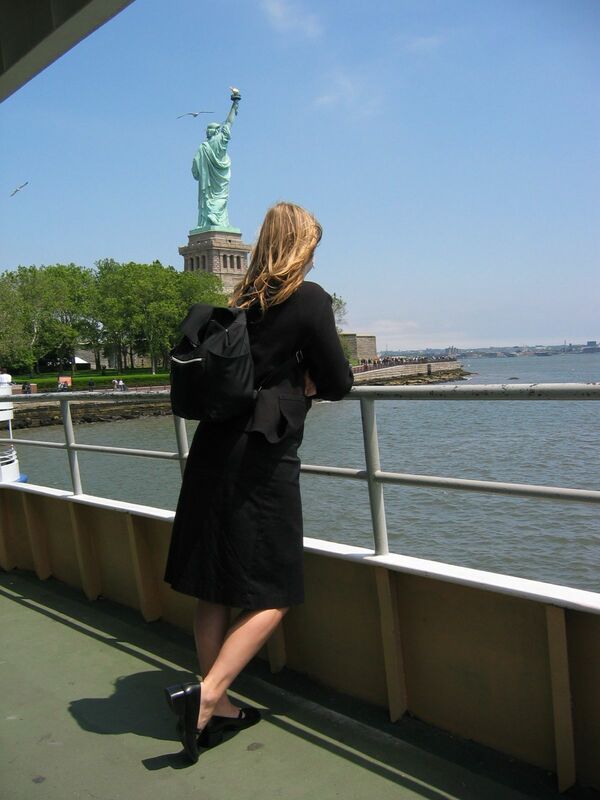 In contrast, nothing much changed when I got married - we were already living together and we do a lot of things separately, including travel, so having a kid really, really changed that sense of freedom and control over my own time/life. We eat a lot of oatmeal too so I've taken to cooking the steel-cut stuff in the crockpot since I've been forbidden sugar and can't eat the instant packs anymore :( But this way, I get a week's worth of oatmeal cooked at a time and we can eat it whenever. My son who was born later the same year as Pumpkin never slept either, and was always super alert, bright eyed, and constantly checking everything out. 4.5 years later I think I finally have begun to understand why his behavior was and is not like most other kids (in a really good way, one that I would never want to change). Cloud has a great post on low-sleep-need kids, and we have a related (but apparently more controversial one, despite that the correlation is well-documented) on giftedness and low-sleep-need. Baguette hated to have her arms swaddled. We wrapped her just under the arms and she was fine. Lovely, lovely post, Cloud. You've inspired me to go back and look at some of our old photos and to write down my memories associated with them. As I was reading your post, it occurred to me that these are the kinds of things our kids will like to read about when they're older. Thanks for the nice comments, everyone! I'm glad you liked the post. Pumpkin's baby photos are adorable. "I think that perhaps I gave up control when Pumpkin was born, and I just never realized it." I was wandering through a parenting post of one sort or another and a father of four or more commented that after their 3rd he stopped caring so much about every little detail because he stopped having any illusions about control over his life. And for all the other anxieties that parenting-type comments give me, that one always makes me laugh. One of my friends keeps needling me about having kids out of sheer perversity, I suspect because he knows I love order and he just wants someone to "suffer" with him. His kids are lovable and I'd gladly babysit them but they're also exhaustingly full of energy.